• Malaria kills 1.8 million children each year and costs Africans an estimated $12 billion USD per year. Would you partner with us as we take the unchanging message of Jesus Christ to a rapidly changing continent in words and in deeds? Together, we can make a difference! For more than ten years, BFL has conducted conferences, seminars and assisted individuals, churches and organizations with resources to address issues affecting every spectrum of the African life. • Our land in Yaounde would be a base for training future leaders while continue to address and assist our present leadership. • I-LEAD: Institute for Leadership, Ethical-studies And Development is a vision of BFL to provide a campus and training in every sphere of life. • Our Executive Director, Dr. Daniel Shu has written an excellent book on Leadership; our president, Rev. 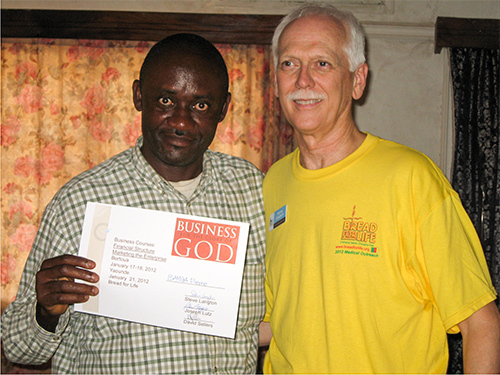 Ernest Ehabe is working on a book project dealing with the myriad problems facing Africa and giving biblical solutions. You can be a part of making history and bringing needed change to the glory of God!